In addition to facing criminal charges, former Grover Beach police officer Alex Geiger has now lost both of his dogs that attacked and killed a 64-year-old man and injured a 85-year-old woman. Shortly after noon on Dec. 12, both of Geiger’s dogs chewed through a fence and attacked Betty Long. Long’s neighbor David Fear went to assist the woman, and the officer’s Belgian Malinois and German Shepherd turned their aggression on Fear. Fear died shortly after the brutal attack. San Luis Obispo County Animal Services initially indicated that the German Shepherd, was not an aggressor and left it in the custody of Geiger. Animal services personnel euthanized the Belgian Malinois on the day of the attack. 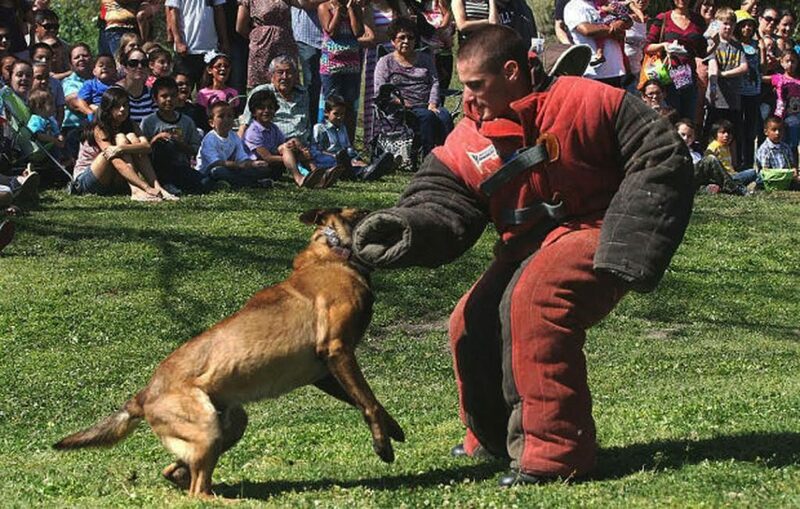 The Belgian Malinois was a former police K-9, which Geiger had handled as an officer and then owned as a personal pet. However, Long, the only witness to the attack, said both dogs attacked both herself and Fear. Shortly after CalCoastNews published information that both dogs participated in the brutal attack, San Luis Obispo County animal services removed the dog from Geiger’s custody. California law requires that dogs be quarantined at at an animal shelter for 10 days after attacking and biting someone in order to be assessed for temperament and tested. Animal Services officials are now saying the German Shepherd completed its quarantine, although it is unclear when and where that occurred, according to KSBY. Eric Anderson, a veterinarian who manages animal services, has faced criticism for his handling of the case. Grover Beach police left the investigation up to Anderson because of a conflict of interest. Geiger, 25, who recently resigned from the Grover Beach Police Department, is facing two felony counts of owning a dog trained to attack while failing to exercise ordinary care. If convicted, he could spend up to three years and eight months behind bars. After serving as a law enforcement officer in the Central Valley, Geiger joined the Grover Beach police force last fall. In September, Geiger purchased the Belgian Malinois named Neo from the city of Exeter, his former employer, for $5,287.50. Geiger brought Neo and the German Shepherd to Grover Beach as personal pets. The district attorney’s office issued an arrest warrant for Geiger last week. Deputies then booked Geiger into a Central Valley jail. He posted a $20,000 bail and was released. Thankful the second dog was taken. What is the history of the second dog? K9 or military? Who paid its license fees? If Grover Beach conflict of interest to what level? Maybe Grover Beach Police Department should be shut down and County Sheriff should take over. I also question the “conflict of interest” claim from GBPD. Are they saying they can’t investigate when one of their employees is involved? If this is the case, then their officers shouldn’t be allowed to arrest anyone, collect evidence or do anything else….because one of their own is involved with all of those activities. If they’re saying they are incapable of providing a non-biased investigation, because a police officer could possibly be implicated in a crime, then everyone arrested by GBPD and charged with a crime should be given a pardon, due to the inevitable bias that comes about when investigating. Shut the whole damn department down if they can’t investigate a murder in their own city! Useless, double-talking idiots. They can write tickets, levy fines, taze, shoot, cuff, slam, lie, and terrorize with vicious dogs….but they can’t investigate a murder? If I was arrested in GB, I’d have my attorneys use this argument in court to get the McEvidence tossed out!